Polish MPs will be offered military training because of fears that the war in Ukraine could spread. 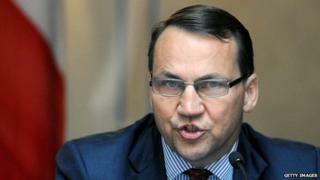 Parliamentary Speaker Radoslaw Sikorski announced that parliamentarians will be trained at an army firing range. The country's military age is capped at 50 but exceptions will be made for "healthy and youthful looking" MPs. Poland's recently adopted security strategy states that the country is threatened by warfare and names Russia as an aggressor. Speaker Sikorski said he hopes the training would demonstrate to young Poles that it was time to start preparing to defend the country. He added that these are "troubled times". Polish Defence Minister Tomasz Siemoniak has called on Poles aged between 18 and 50 to undergo voluntary military training. The offer comes after Krystyna Pawlowicz, a 63-year-old MP, asked to be given military training to provide an example to others. Warsaw has been a firm opponent of Russia's actions in Ukraine and many Poles are concerned the country could come under attack. An opinion poll from May last year found 61% of respondents felt the Ukraine crisis threatened Poland's security. In another poll from April, when asked which country Poland should most fear, 80% of respondents said Russia, up from 49% in 2010. On Thursday, a top Polish official said that arming the Ukrainian army could stop the conflict in eastern Ukraine escalating. Stanislaw Koziej, the head of Poland's National Security Office, said that it was in the "interest of Europe, of Poland and of Ukraine to strengthen Ukraine's army and to supply it with weapons." So far Poland has only offered non-lethal supplies and training to the Ukrainian government.